I firmly believe that God always has been, is, and will continue to be The Miracle Worker so long as this physical and fallen world exists. I believe that I am a miracle myself. That King Jesus would step out of heaven in obedience to the Father’s command to fulfill everything necessary to save wretched sinners such as I is the greatest of miracles. That this same great God would desire to and enlist His forgiven and redeemed children to join Him in the mission of saving the world is a miracle. And while we may not see Jesus walking on water, calming the seas, raising the dead, or feeding five thousand (with very little resources), I believe that God is preforming miracles all around us each day. One such miracle was confirmed for my wife and I this past week. Sarah and I have been married for almost 11 years (May 29th) and we have one child, a beautiful and amazing little princess, Madi, that is 4 (soon to be 5 in June) years old. The fact that Sarah and I have been married for so many years but have only one young child has not been by choice. Our desire and attempt to have children has been a difficult journey. 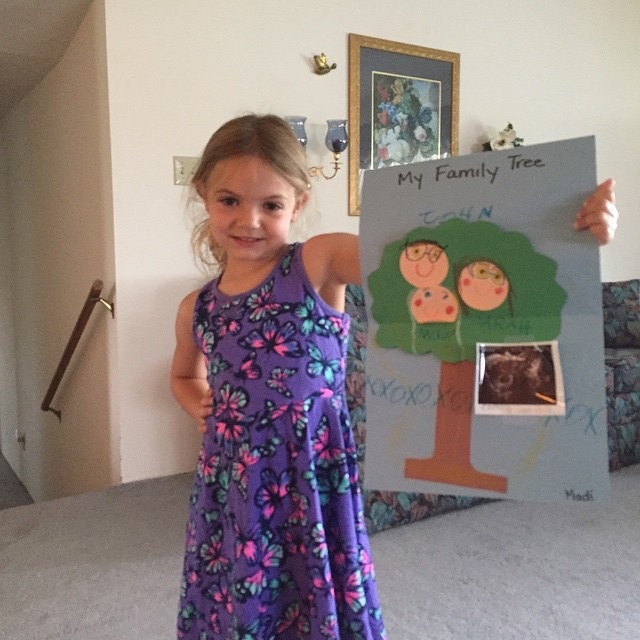 Prior to Madi being born we had waited over 3 years for her conception and birth. During that time we waited and prayed and agonized, all the while knowing that in due time God would provide. Just when we began to lose hope, even visiting an infertility specialist, God did indeed work a miracle and provided our beautiful Madilyn Faye on June 17th 2010. Fast-forward a few years. Sarah and I decided we were ready for a second child and began asking God to provide. We found ourselves in the exact same place as before. After almost 3 years of asking God for another child and waiting, we again visited an infertility specialist. Upon this visit and based on the result of some ensuing blood work, the specialist told Sarah and I that at this time it would be impossible for us to have a child. Might I add here that when a human being uses the word “impossible” I have learned and grown to the point of always weighing it very carefully. When the disciples asked Jesus who could be saved Jesus responded by saying, “With man this is impossible, but with God all things are possible.” (Matthew 19:26) While Jesus was speaking to the disciples in a specific context, if salvation is possible for God, and it is, nothing else can be impossible. The visit with the specialist in which impossibility was declared was 5 weeks ago. This past Friday Sarah and I visited a local doctor and received confirmation that Sarah is 6 weeks pregnant. I believe in miracles. I’m a miracle myself. And God is preforming miracles every day in my life. I must say that I am heartbroken and deeply sympathetic towards those ultimately unable to have children. While Sarah and I have waited long periods of time, in the end we have been blessed with two gifts of life that some couples never receive. Sarah and I have gained just a small glimpse of the hurt that comes with questions like, “When will you have children?” or “When will you have your next child?” all the while knowing that we deeply longed for it but were not receiving it. Why some couples never receive the blessings Sarah and I have received is beyond my ability to answer. While I am deeply grateful for the existence and beauty of adoption, I also agonize with and pray for couples in this situation.